Norwegian company Opera Software acquired the virtual private network service (VPN) SurfEasy back in March 2015. We expected Opera to integrate the service in the browser at one point in time, and it looks as if the company has started to do just that. For now though, it is merely a promotion of the service in the browser and not a native integration of it in it. The promotion is available in Opera Dev currently, but only when you launch a new private browsing window in the browser. When you do that, you find it advertised on the first page that opens next to the usual information about the browser's private browsing mode. It makes sense to promote the service there, not only because it reaches users who are interested in privacy but also because it is an improvement of the private browsing mode. As you may know, private browsing blocks most local data from being written when it is used but does not affect remote data at all. A virtual private network protects you online, not only from network spying but also by hiding your IP address from websites and services you connect to. 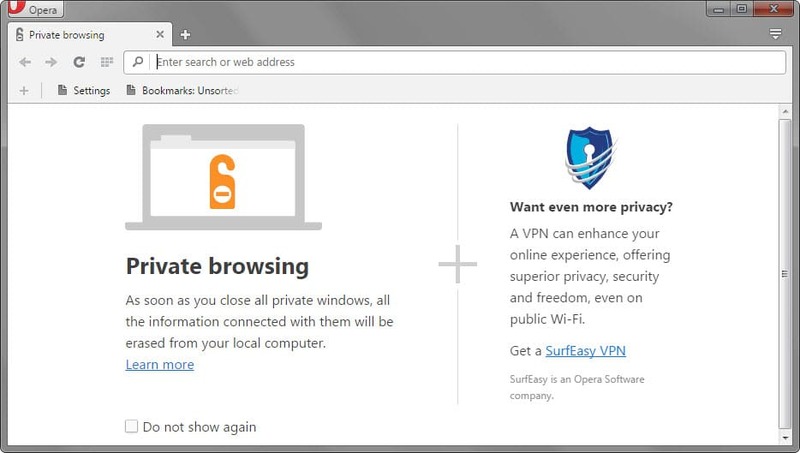 The SurfEasy VPN promotion states that and links to a special landing page on the SurfEasy website that offers additional information and sign up options. A VPN can enhance your online experience, offering superior privacy, security and freedom, even on public Wi-Fi. Several plans are listed on the page including a free starter VPN plan that is good for 500 Megabyte of free data and options to increase free data through various means. Total VPN and Mobile VPN on the other hand are paid plans that are available for $3.99 and $2.49 per month when paid annually. Both feature unlimited data and ad tracker blocking on top of that. The core difference between the two plans is that the Total VPN plan supports up to 5 devices while Mobile VPN only one mobile device. Opera users who don't want to see the promotion in the web browser -- it is displayed whenever a new private browsing window is opened -- can turn it off. This can be done in two ways. First, by checking the "do not show again" box when the private browsing window spawns. Second, by switching a flag on the experiments page. Load opera://flags/?search=surf in the browser's address bar. This should display SurfEasy promotion as the only result. Switch it from default (enabled) to Disabled. The promotion is only available on Mac and Windows systems and not on devices running Linux. What about Opera Turbo? Opera Turbo is a compression proxy that tunnels connections through Opera servers to speed up the loading of websites. It is not the same as a VPN and unlikely to be affected by further SurfEasy VPN integrations in the browser. 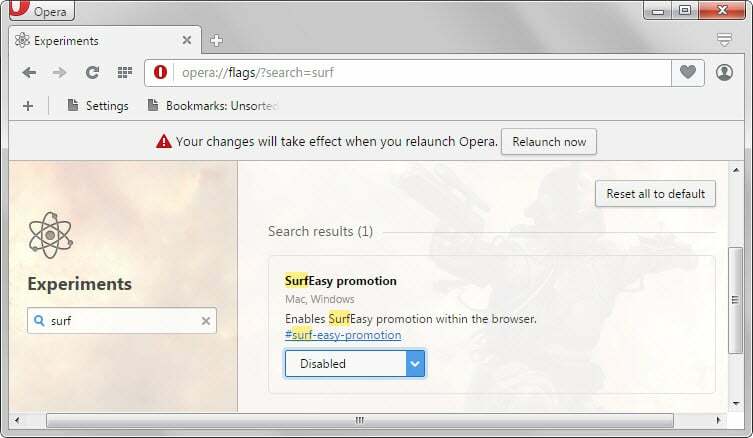 Opera Software started to promote SurfEasy VPN in Opera Dev builds. Find out how this looks like and how to turn it off. Don’t get it–promotional opportunity. Opera is that desperate? Or the browser is that insecure? Maybe Ghacks could provide VPN usage for “Patreon” members who are “donating” $10/month. Maybe Yahoo and Google and, and, and the world will be one big choice of VPNs. Or maybe it’s just Opera promoting a product or service that’s theirs on their own browser. Inspector Lewis solves another crime–that’s a good one. Or, myabe, SurfEasy is owned and operated by ISIL or Iran, so those who pay are actually supporting the bloodshed of millions. SurfEasy while we eliminate the infidels. Or it’s American made! So while America drops drones, everyone can SurfEasy knowing their traffic is being safely saved. SurfEasy claims that they do not keep logs. @jasray SurfEasy is actually a Canadian company. SurfEasy VPN is also available on Android. “Claims!” So no real documentation, but users trust them. Smart. Canadian? Sort of like the guy who just downloaded a YouTube video that was georestricted to India; he’s a US user. Rather easy click, click, paste, boom–now a user in India, purple silence–download, zappo–but, wait, this guy is a US user in the US; he’s not in India. But the Internet says he’s in India because it allowed him to download the video. And I’m an American? Because some pieces of paper say I am? I think we speak different languages, sir. U know, maybe they would also consider using IronSocket as their vpn cuz many people recommended me the vpn and i thought it works really great. Its not that known yet but once it everybody knows about it, boom. just like that.